We’d love your help. 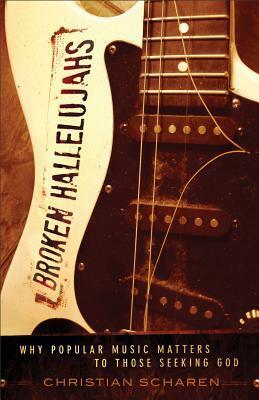 Let us know what’s wrong with this preview of Broken Hallelujahs by Christian Scharen. To ask other readers questions about Broken Hallelujahs, please sign up. I got this book last summer in a small bookshop in England. And I'm so glad I found it. It's an excellent analysis of Christian interactions with pop culture. Christian Scharen outlines the importance of interaction with culture for the Christian life. The case studies in the book are powerful and really highlight how art and faith are tied together. Although Scharen is prone to getting a little off-point in order to expound on his personal favorites, the history of pop music that he presents is I got this book last summer in a small bookshop in England. And I'm so glad I found it. It's an excellent analysis of Christian interactions with pop culture. Christian Scharen outlines the importance of interaction with culture for the Christian life. The case studies in the book are powerful and really highlight how art and faith are tied together. Although Scharen is prone to getting a little off-point in order to expound on his personal favorites, the history of pop music that he presents is fascinating enough that I'll willing to let these digressions slide. This work is an exceptional theological argument for engaging "with" instead of "at" popular culture! The anti-dualistic viewpoint is based on the premise that God created the whole earth and we constrict imagination when we checklist segments of society as "Christian" and "non-Christian". Scharen carefully navigates through a well-informed series of examples including C. S. Lewis, U2, Leonard Cohen, Kayne West, Billie Holiday, Arcade Fire, Harry Potter and many others. Chapter 4, "Cries", was o This work is an exceptional theological argument for engaging "with" instead of "at" popular culture! The anti-dualistic viewpoint is based on the premise that God created the whole earth and we constrict imagination when we checklist segments of society as "Christian" and "non-Christian". Scharen carefully navigates through a well-informed series of examples including C. S. Lewis, U2, Leonard Cohen, Kayne West, Billie Holiday, Arcade Fire, Harry Potter and many others. Chapter 4, "Cries", was one of the most challenging and life-changing pieces I have read in a very long time. Great Book that has informed my thinking of why secular music is important for Christians to engage with! Christian Scharen (PhD, Emory University) is vice president of applied research at Auburn Theological Seminary in New York City, New York. He has authored a number of books, including One Step Closer, and is the book review editor of Ecclesial Practices.